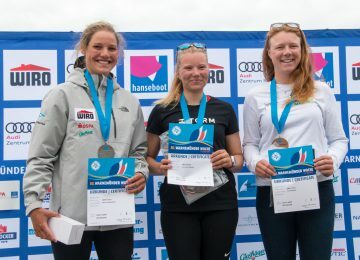 Two new races were completed today in Medemblik, Netherlands, where 2017 Laser Radial Women’s and Men’s World Championships has concluded now their Qualifying series. 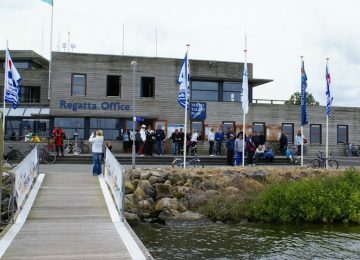 Light to medium wind marked fourth day of competition on the Ijsselmeer. 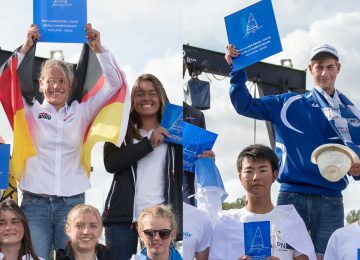 Nice results for our European sailors, still on top of rankings after 8 races. Evi Van Acker BEL (4-3-3-9-2-15-3-3) had her best day today and continues to lead Women’s World championship with 27 points, now followed by ascendant Marit Bouwmeester NED (29-27-3-6-1-2-1-1) with 41. Japanese sailor Manami Doi JPN (34-5-7-2-2-5-4-23) dropped to third with 48 units. Fourth and fifth positions are also held by Europeans. 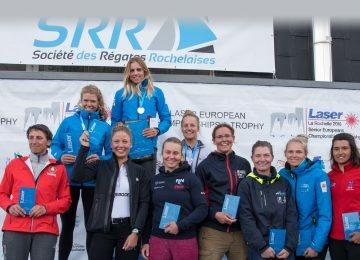 Mathilde de Kerangat FRA (4-9-17-13-6-7-10-4) and Svenja Weger GER (8-2-31-10-1-1-16-21) occupies those places with 53 and 59 points. Maxime Jonker NED, Agata Barwinska POL, Pauline Liebig GER and Mária Érdi HUN are also close to leaders with 63 to 65 units in places 8th to 11th. Polish sailor Marcin Rudawski POL (16-15-1-3-6-1-5-4) continues to lead Men’s fleet with 35 points, now followed 4 points behind by Maxime Mazard FRA (2-35-13-5-2-5-2-10). Australian sailor Zac Littlewood AUS is now on third with 49 units. Nice day again for Eliot Merceron SUI (9-31-14-64RET-1-2-8-1), climbing to fourth place overall with 66 points. Alfonso Fernandez ESP (5-3-2-18-11-12-20-25) dropped from third to sixth with 71. Bad day also for Axel Rahm SWE (3-22-5-1-29-4-15-35), now 7th overall with 79 points. Nik Pletikos SLO, Aleksandr Moliakov NED and Nicolo Elena ITA are also part of provisional Top 10, in places 8th to 10th respectively. 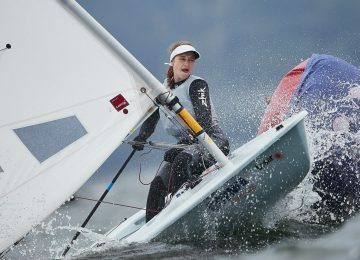 Sailors will start racing Final series tomorrow, divided in Gold and Silver fleets, so stay tune!